‘No further changes to alcohol duty’ is the usual line from George Osborne in his Budget speech. 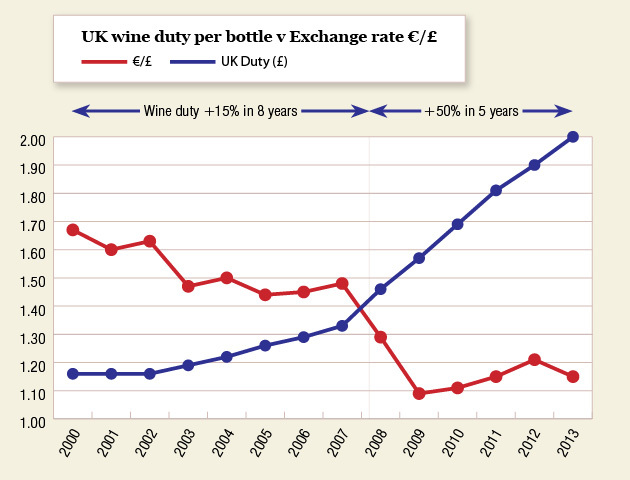 Don’t be fooled: with the Government’s duty escalator in place, wine duty will hit £2 a bottle, up 50% in 5 years. With 20% VAT on wine and duty, exactly 50% of a £6 bottle will be tax. If you like wine from Europe, my little graph says it all. Feel free to leave a comment, or share this on Twitter or Facebook below. Thanks. My view is that the significant pricing issue is not retail pricing but the level of restaurant pricing. The mark up on wines (after costs of purchase, delivery, storage, serving to table, etc) is disproportionately greater than for comparable costings of the food. This is the disgrace. For wines of even modest quality the Duty/Vat contribution to the retail cost is of little or no real significance. Thanks for the comment, Neville. I'm afraid it has always been thus. Worth a separate blog post perhaps. Like the clarity of this graph … but the trends are both going in the wrong direction! and in France where they have less binge-drinking town-centre problems blamed on overly-cheap alcohol in Britain, duty is running at… about £0.02p isn't it? Tommie, yes. 3p, I think.